The piece de resistance for lunch aboard The Siam Junk during our travels in the waters of Phuket, Thailand, was Fried Fish with Chili Sauce. Will says to save the delicately flavored fish for something else and instead use a whole red or white snapper, grouper or similar fresh fish. Ours had been swimming in the waters we were sailing through that morning. It's a Siam Junk specialty served to a group of diners who help themselves to spoon sized portions until all the flesh is gone. The shared food experience is an important part of the Thai sabai sabai lifestyle. Loose translation: relaxed enjoyment. Cut three or four slashes in the sides of the cleaned fish and liberally sprinkle with the rice wine. Dust the dampened fish with some flour and fry in hot oil until crispy. While doing this, heat a wok with a little oil and stir fry the chilies and onions until fragrant. Add the fish sauce and bring the liquid to a light boil. Add the palm sugar and stir the mixture until it is completely dissolved. Add corander leaves and stir intermittently until the sauce has reduced and thickened, about 5 minutes. Remove from the heat and transfer sauce to a serving jug. Place the fish on a serving platter garnished with carved vegetables and accompany with sticky rice (khao niao) and the sauce. Normally diners break off small pieces of the fish with chopsticks (or a spoon) and transfer the morsel to their plate. Traditionally, they would roll this into a ball with a little sticky rice and dip it into the sauce before popping it into their mouths. 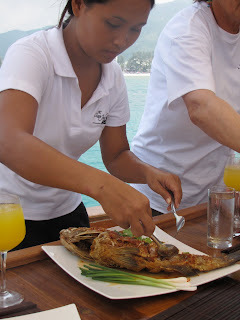 No one told us the part about rolling with sticky sauce and dunking in sauce, but we combined fish with sauce, using utensils the Thai way - fork to hold and cut, soup- or table-sized spoon to eat. However you do it, the presentation is grand and the flavor is grander. There won't be any fish left.